Trade Dubai’s glitz and bustle for an enchanting evening in the desert on this half-day, small-group tour. In the afternoon, set out from Dubai and travel across sand dunes in a 4x4 Land Cruiser. 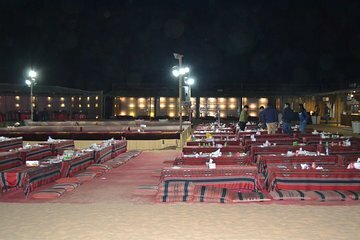 Following a photo break for sunset shots, arrive at the Bedouin-style camp, where you’ll go camel riding, will try henna painting, will listen to local music, and more. Then, enjoy a hearty, barbecue meal, complemented by different dance performances, before returning to the city.